The Prime Minister’s comments on the importance of economic growth over climate change action, reported in a recent article in the Toronto Star, create a false choice. They are evidence that he has ignored the advice from some of Canada’s brightest minds, who for the last 25 years worked on the convergence of environmental sustainability and economic prosperity. In fact, the federal government dismantled the National Roundtable on the Economy and Environment (NRTEE) in March 2013. The mission of the NRTEE was “to generate and promote sustainable development solutions to advance Canada’s national environmental and economic interests simultaneously, through the development of innovative policy research and advice.” We need this advice now more than ever! In its 2009 report, Achieving 2050: A Carbon Pricing Policy for Canada, the NRTEE called for application of the polluter pays principle to carbon-producing industries. This is not a new concept, and there are numerous ways that this might be best applied, including fines, carbon taxes, or a cap-and-trade regulatory system. It’s a way to capture externalized costs and make sure that they are reflected in the price of goods. Pricing carbon has the potential to increase investments in clean energy alternatives, by giving companies “an economic incentive to find better ways to reduce harmful greenhouse gas emissions and support clean energy“. 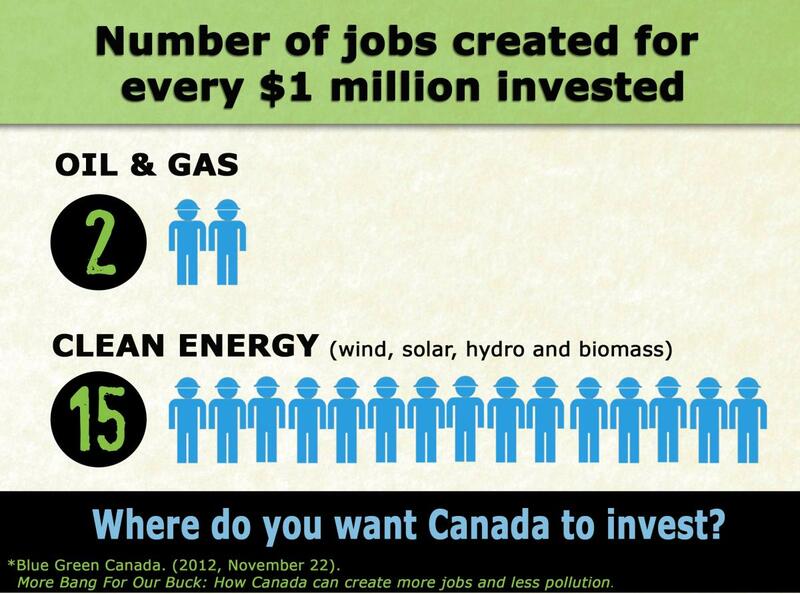 The argument that supporting our fossil fuel industry creates jobs must be viewed in relation to comparable investments in alternative energy. 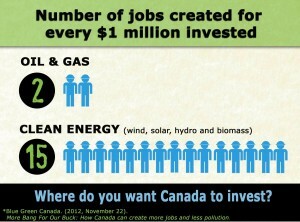 In their report More Bang For Our Buck: How Canada Can Create More Energy Jobs and Less Pollution, the Blue Green Alliance shows that investments in efforts to reduce pollution create more jobs than comparable investments in fossil fuels. This report proposes an alternative path for Canada, one that is better both for our economy and our environment.